My comedy duo, Just Shair, recently did a Christmas video too and parts get kind of silly involving why parents don't actually give coal to bad kids and how Santa probably has white privilege. Please watch, enjoy, and subscribe! What a fabulous combination!! I think the purple is perfect too Lauren!! OMG such vibrant and feisty colors, totally living up to the festive mood! Loving the pop of colors in your outfit. This is such a cute festive outfit, I love how you styled it and you look gorgeous. I'll never argue with adding purple to anything. haha. The idea of Santa having white privilege is pretty funny too. That's such a cute skirt, girlie, and it's perfect for the season. I'm also loving that cardigan, as mentioned on IG, the color looks gorgeous on you! Thanks for sharing and I hope you're having a great week so far; good luck with the move! Such a great combo! I would never think to add purple with red and green - but it looks great here :] Good luck with the move! Cute top!! In love with your look! You look super cute, you style the colors real good! 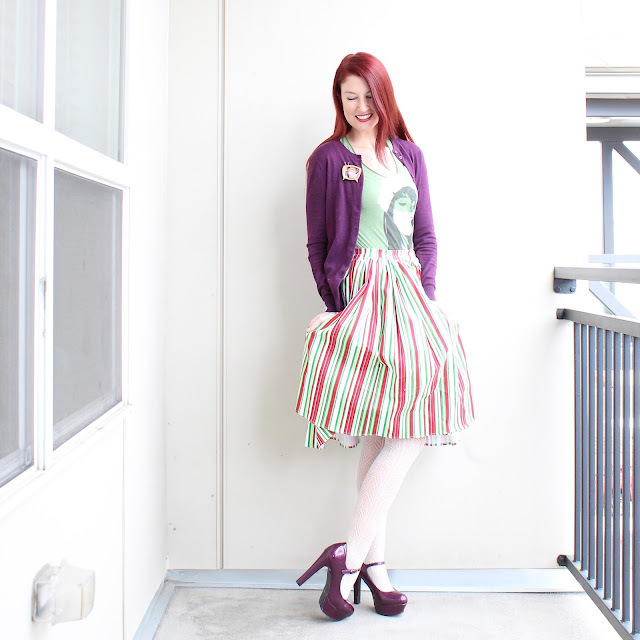 I love the colours and strips in this skirt, also loving those purple heels on you! Yes, trespassing! For the sake of Christmas spirit :) Well, I would find it sweet, but I confess I would prefer to be in peace :) Poor carolers, but I don't like that, because it makes me cry :( There was once some in Austria, but at the time I didn't cry, though now I do even at Tv ads :) Loooved your skirt and Sonic Youth T-shirt and the shoes, wow! Always looking great! Wishing you a great new year's eve! Thanks for always being so sweet towards me, really! 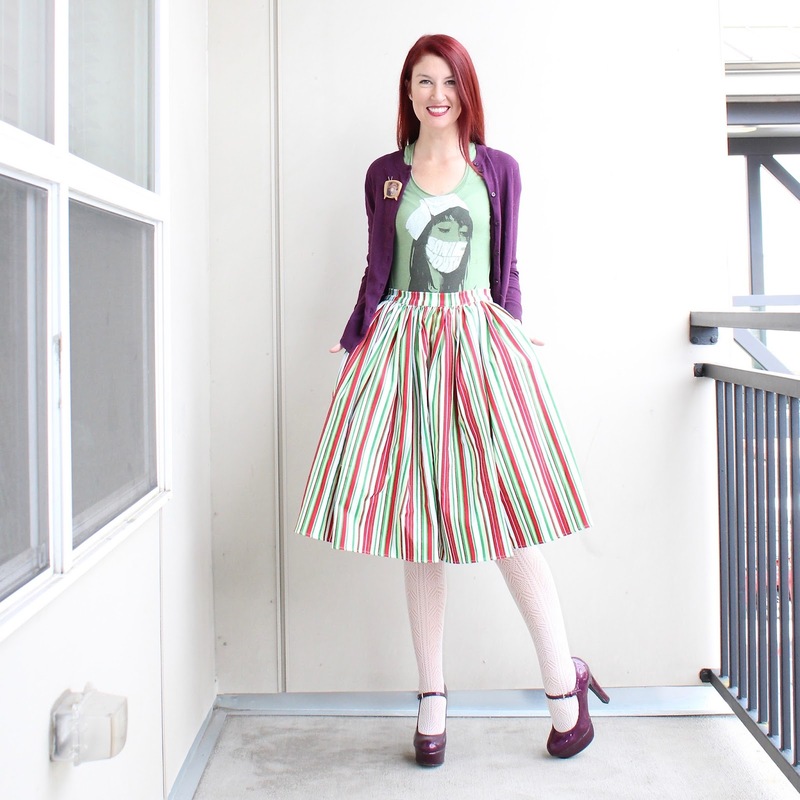 That is such a fun striped skirt and the color are perfect for this time of year! So festive, lady! Wishing you a happy Christmas! 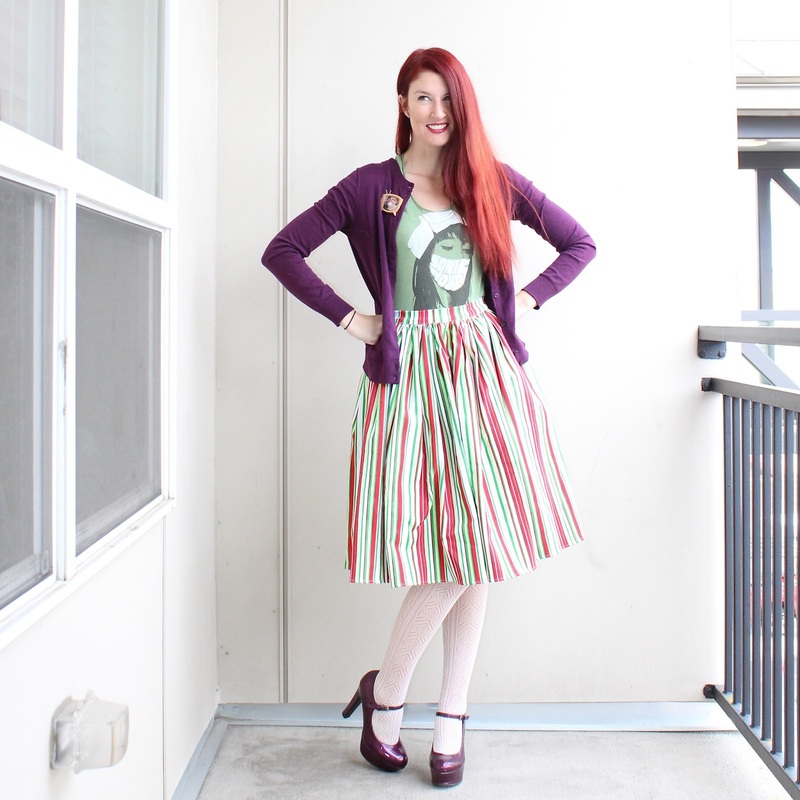 that striped skirt is perfect for christmas! so cute! 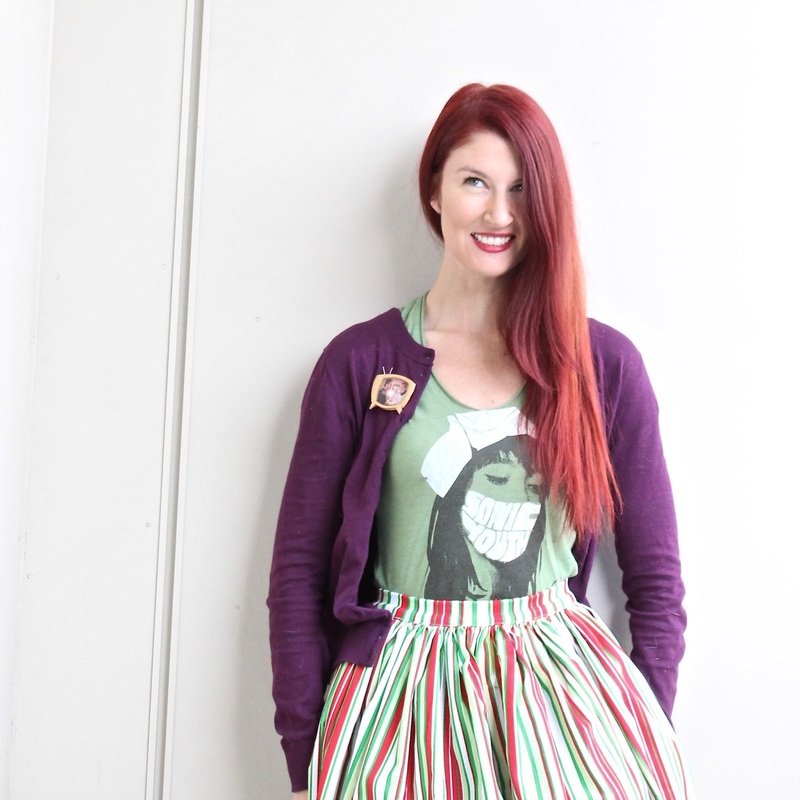 Green and purple are such a fab combo, but throw some red in and you just upped the cool factor! 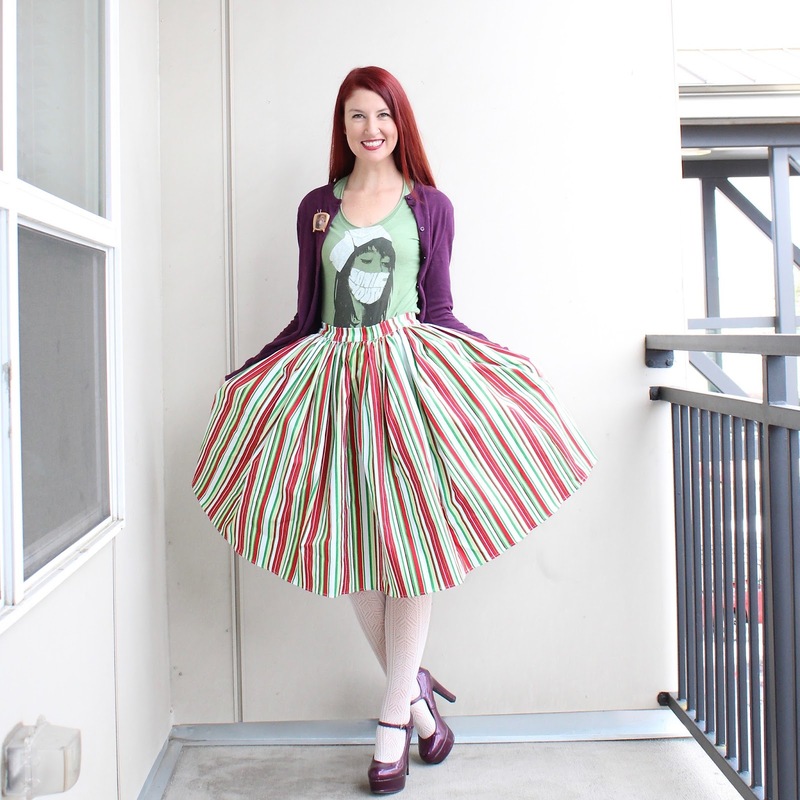 Even though you don't celebrate Christmas, this skirt would be great for the holiday season. I'm excited to see how you'll style it other times too because I always have a hard time with green and red when it's not the holiday season. My mind always says "ooh that's too Christmasy" and I shy away from it. Your hair! Wow, your hair is so awesome. I love it! Your cabana skirt is so fun. I really like how you styled it with some purple items. Love your MJ platforms. They are the best. I hope you have a great week dear.